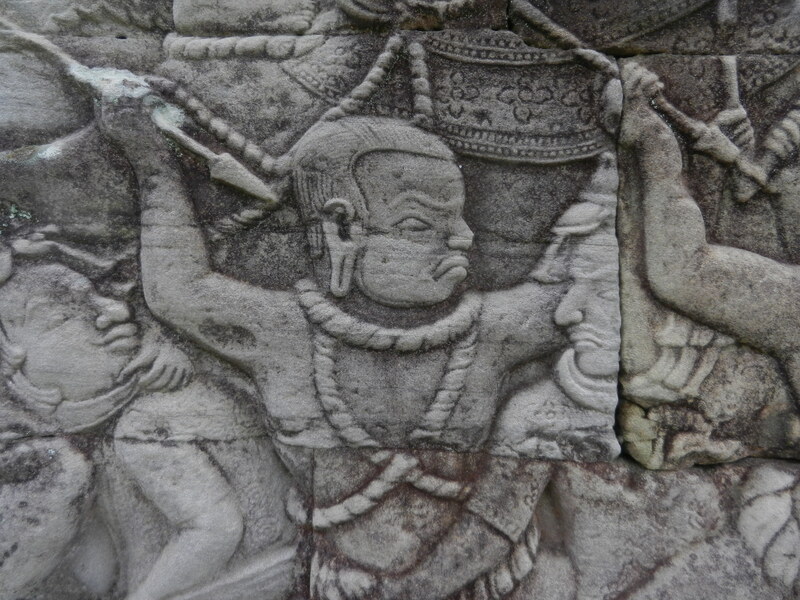 The Khmers loved action scenes, and the Bayon at Angkor Thom has them in abundance. Crocks juice up Angkor Wat’s sculpture too. 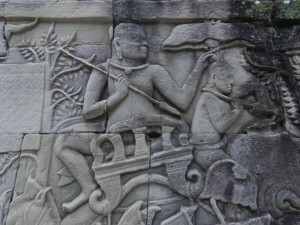 But the Bayon showed many scenes of ordinary people, so now the beasts feast on them as heartily as folks eating animals in the last post on the Bayon. What’s going on? 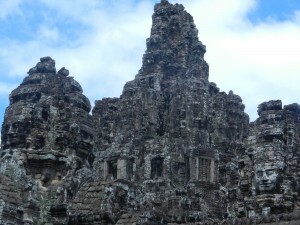 The Bayon at Angkor Thom was built in a crucial time. King Jayavarman VII erected it as his royal cult temple. 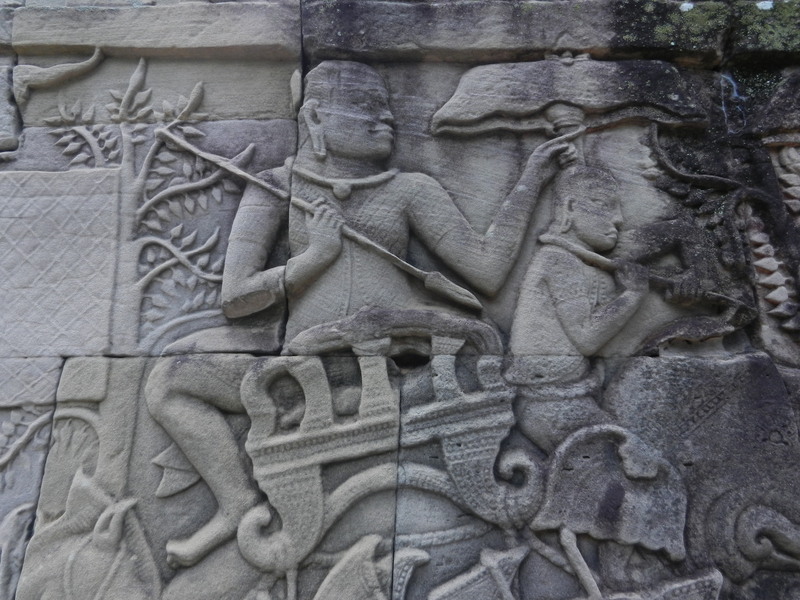 But he took the throne after succession crises which followed the reign of Angkor Wat’s builder, Suryavarman II, and after wars with the Cham in Vietnam (a great and little-known culture well worth exploring), in which they invaded Angkor. Cham oarsmen in the boat in the above shot look determined to take warriors into the heat of battle. 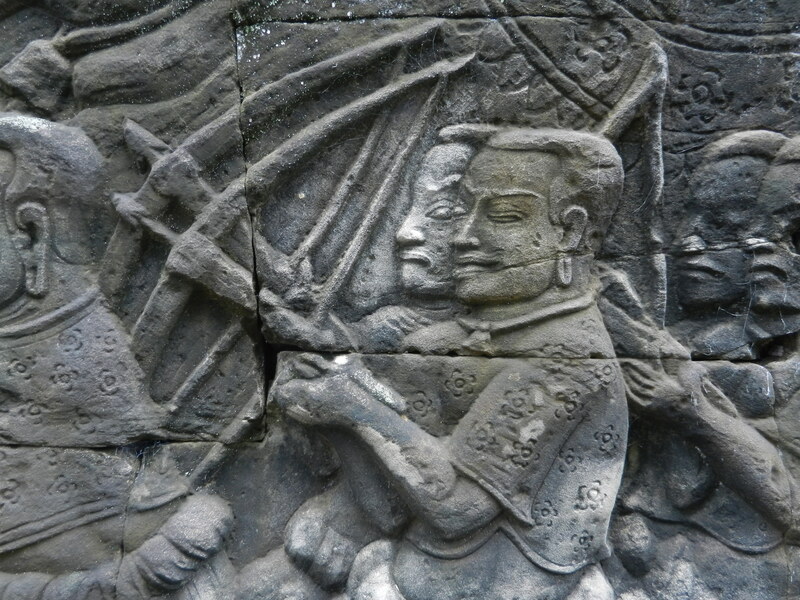 BP Groslier thought that the Bayon’s sculpture celebrates a great naval battle on Tonle Sap (the lake by Angkor, which floods the rice fields in late spring/early summer) in which Jayavarman bested the Cham warriors and drove them out of Angkor. 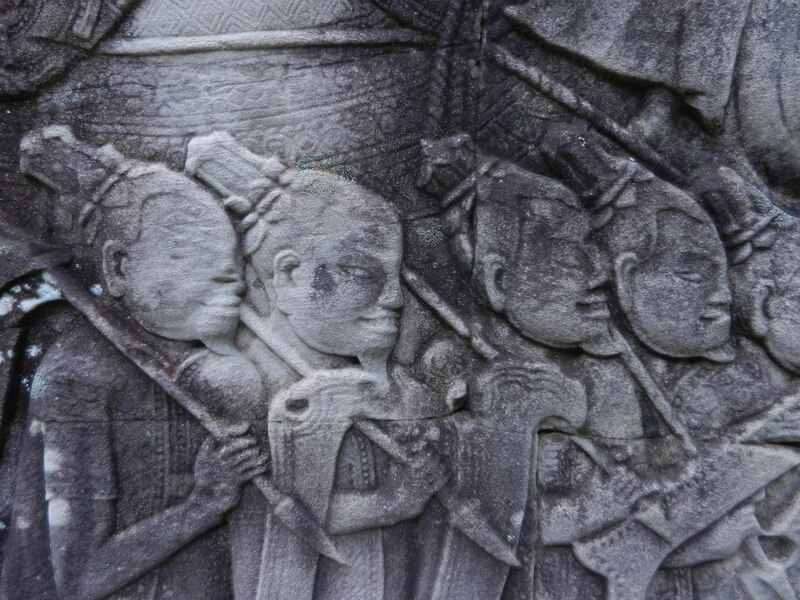 Khmer warriors had close-cropped hair, elongated pierced earlobes, and a rope around their necks. Khmer nobles proudly rode under parasols, as they did on Angkor Wat. The soldiers in the above shot might be Chinese. They have long beards, normal ears, thin eyes and hair in topknots–they’re sharply distinguished from the Khmers. 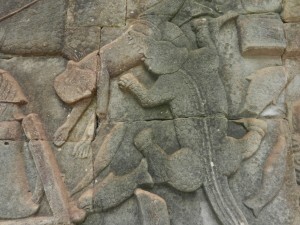 Above, we can see Khmer and Cham warriors going at it. But some scholars, including Vittorio Roveda and Michael Vickery, have thought that there’s no convincing evidence for a great naval battle with the Cham (Bayon, New Perspectives, ed, Joyce Clark, p. 353). Some inscriptions say that the Cham came by land in carts. 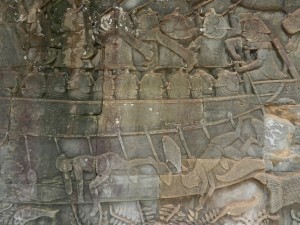 Roveda thinks that these Bayon scenes are of a mock battle that the Khmers staged during a festival which commemorated the Khmer victory. 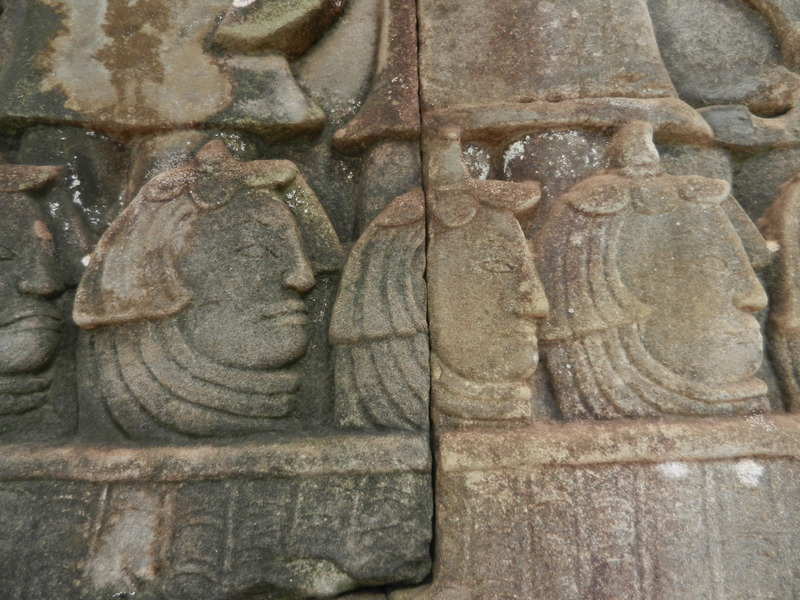 The social scene on the Bayon’s more complex than good Khmer/bad Cham. 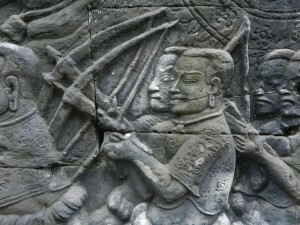 Both sometimes fight together in the same army, as though Khmer and Cham soldiers broke into different factions. The Bayon’s fight scenes might represent a series of many battles over a long period in which Jayavarman VII campaigned for the Khmer throne. 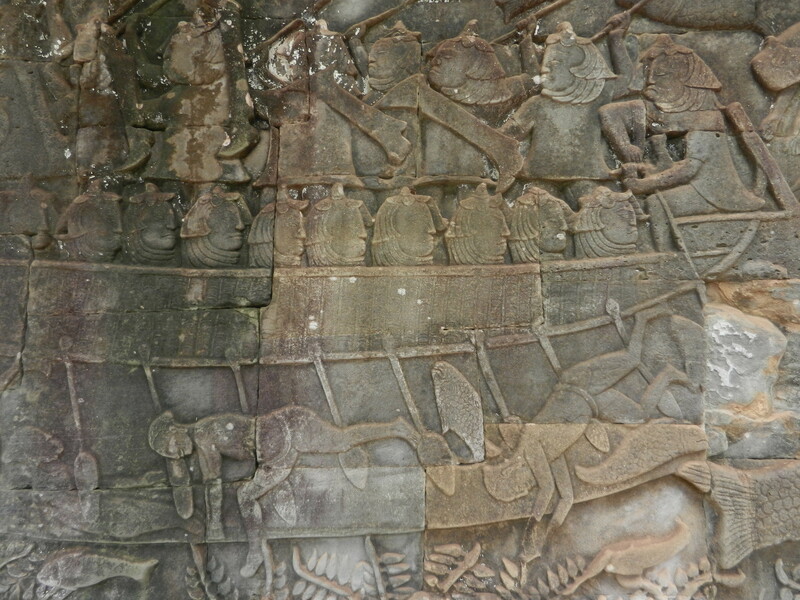 But whether “The Battle of Tonle Sap” was real or not, the battle scenes enliven several places on the outer gallery which surrounds the Bayon’s central section. They alternate with scenes of daily life in Angkor. The latter have been admired for their folksy and sensitive portrayals of common people. 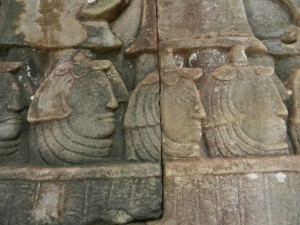 The historian David Chandler noted that Jayavarman VII had embraced a form of Buddhism that stressed compassion. But if these ordinary scenes exemplify care for his people, why alternate them with so much violence–especially if it was just a mock battle? Since Jayavarman had to assume kingship violently, he might have been demonstrating that the Khmer people’s well-being depended on his power to defeat their foes. 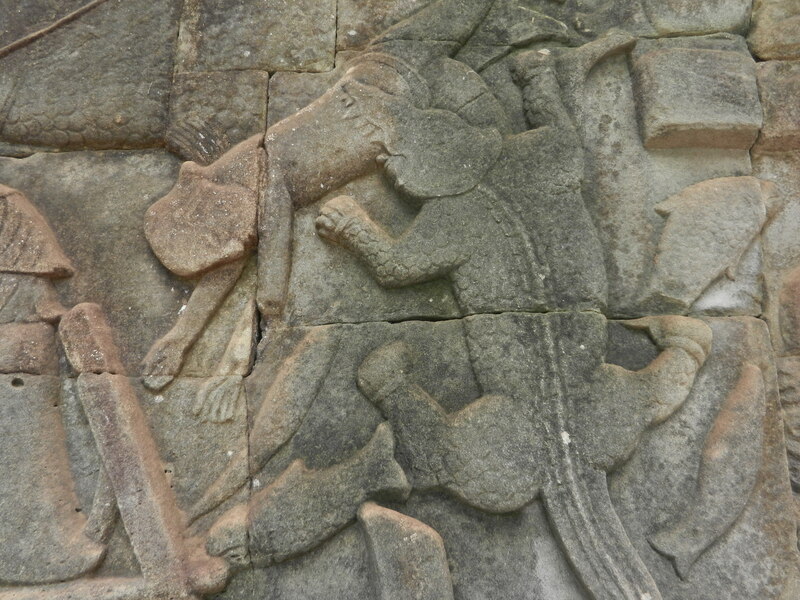 Tenderness and violence alternate many times on the Bayon. But all the scenes pulsate with energy. They don’t show people as distinct figures like Western sculpture often does. People are often animated, and they interweave with dense natural landscapes, which include crocs with attitudes. From the central tower in the above photo, to all the scenes in the outer gallery, the Bayon is sheer exuberance which includes all aspects of life. I didn’t know whether to stay longer and enjoy all the human drama, or run before I disintegrated.